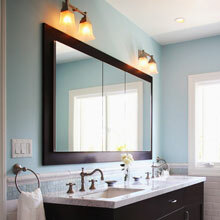 Mirrors offer a flexible option to enhance the appearance of your home or workplace. The reflective surface can increase light in a dimly lit area, create an illusion of more space or add a touch of elegance for your unique interior. When an off the shelf product won’t provide a solution for your vision let the experienced technicians from House of Glass lend a hand. We can install your product or create a custom application that meets your exact needs. For more than 3 decades, House of Glass has been creating and installing custom mirrors in Newark and throughout Essex and Morris Counties. Call us today to discuss your ideas for home or business at 973-674-4228. There is no limit to what we can do and surprisingly a custom cut mirror does not always have to cost an arm and a leg. As the premier mirror glass service in Essex County, we know how to get a job done efficiently saving you money. We start by giving you an accurate estimate for your project. Since we have created and installed hundreds of mirrors throughout the Newark area we know how to keep our costs low. Our technician will take exact measurements to meet your specifications. We get it right! For custom applications we craft your product in our Essex County shop. This may include precise cutting, adding beveled edges or framing. Finally, you can expect expert Installation to fulfill your vision. Our highly trained technicians will go out of their way to provide you with prompt and reliable services. As a full-service glass shop we can install and repair commercial glass windows and doors as well as custom shower doors and even table tops to meet all the needs of your business and home. Your satisfaction is our #1 goal. If you live in the Newark, Essex or Morris County, NJ area, and are interested in a mirror installation project, House of Glass can help. 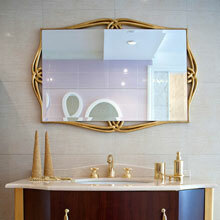 For over 3 decades, we’ve established ourselves as one of the area’s top mirror installation companies. We can recommend the right products, materials, and layouts for your mirror glass project. Contact House of Glass today at 973-674-4228 to learn more! Get 5% Off On Your Next Glass Job When You Schedule An Appointment Today!